My curiosity in ceramics was aroused whilst living in a traditional pottery area in ​Japan and encouraged me to explore the medium at greater depth. I trained with Bruce Chivers on my return to the UK. I am drawn towards the challenges of the wheel, the physicality of throwing and the capricious qualities of porcelain, a material I find demanding and absorbing. My pots reflect the experience of living in Japan – I do not consciously aim to create Japanese style pots, but there is an influence of traditional form. 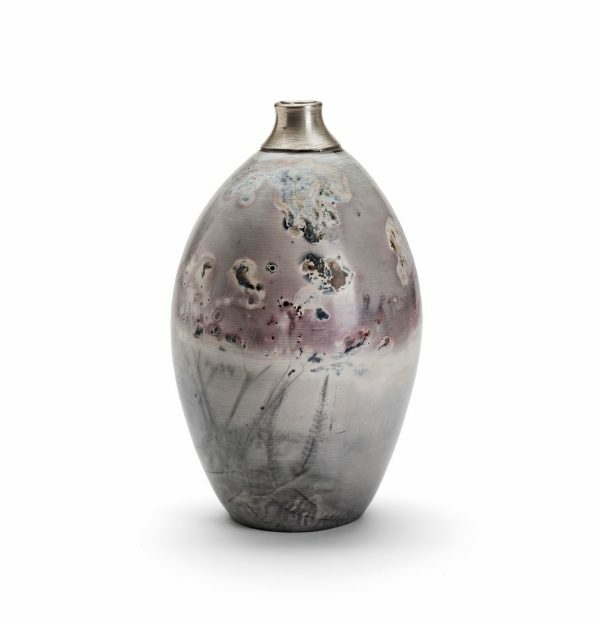 ​I am inspired by work decorated by flame and fire that reflects the process of making and firing. I fire in a sagger(a container) packed with organic combustible material in which pots are buried. The sagger is sealed and placed in a gas kiln and fired slowly. The natural materials collected from Dartmoor and the Devon coast turn from solid to gas and transfer colour, pattern and texture to the pot. The combination of the elements permeate the clay and create unique, unrepeatable surfaces. ​I also enhance the rims with PMC silver clay. The pots are waxed, sealed and polished. ​I work in the knowledge that the decoration will never be repeated, each pot as a canvas with it’s own character and story Some have clear definition of leaves and ferns, others resemble abstract landscapes. I enjoy the risk and varying emotional responses derived from the process and find the controlled atmosphere that produces uncontrolled results reflects life itself and allows me to be adventurous.